It says 2008 on the bag, could that be right? Gave the old stainless wok another go with some more of my courtesy-of-OCR green offer samples grab bag. 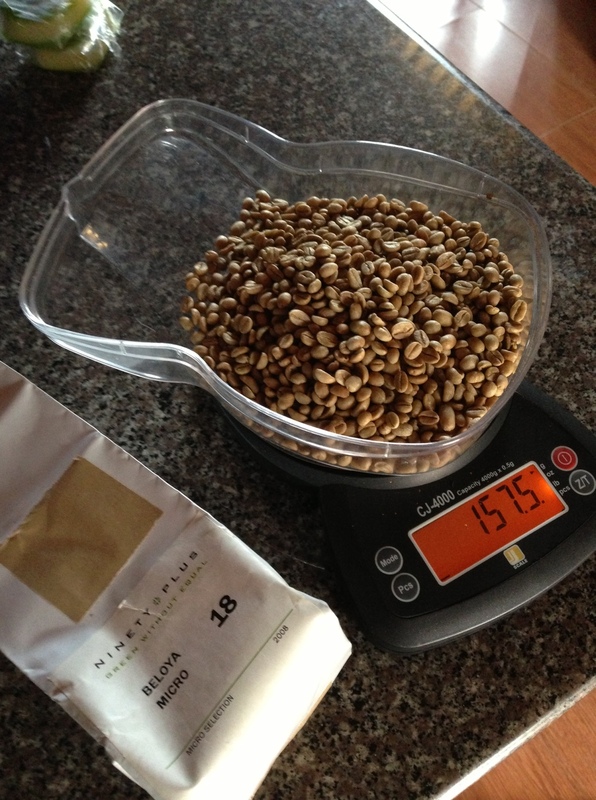 This one was from 90-plus, a natural-process "Beloya Micro 18" from Ethiopia. No more info on the coffee other than that, as 90-plus has their own scoring and branding system for green coffee, evaluating and flavor notes - full transparency not being part of that system. They have good coffees, and loyal customers, so they must be doing something right. This roast was a little quicker than the last, finishing at around 18 minutes with first crack between 14-15 minutes. The aroma during the roast opened up into a raspberry-lemon floral feast for my nose. I've relented in my efforts to speed up the roasts to a more sample-roast-style timeline, as that has led to severe scorching and underdevelopment. The 17-24 minute mark is shaping up to be a good balance for now. As I do more of these, I'm sure I'll learn some better techniques and maybe stumble upon some better practices. In the cup, I could still taste some tipping (singed ends and edges of the roasted bean), but the roasts are becoming more even and express what I feel are the attributes or origin, cultivar and process in a more transparent way. A very clean natural, the raspberry-lemon aroma remained in the flavor, along with sugar cane sweetness and medium-light body, like a good sorbet. The tipping shows up a bit in the finish, but doesn't overpower the floral aftertaste. Even if it was from the 2008 crop, enough flavor and acidity remained to show itself in this roasted sample. I'd have to taste it side-by-side with other coffees, properly roasted in a sample roaster drum, to really be able to tell. But, in this time of great coffee scarcity for me, this was a real treat. Look Ma, less tipping! I've heard that the "Amber beans make it special." Totally not true, but it does help me to identify natural-process coffees!